Cost Effective Tricks For Saving On Ink Cartridges | GUI Tricks - In Touch With Tomorrow! Cost Effective Tricks For Saving On Ink Cartridges - GUI Tricks - In Touch With Tomorrow! Most of the printer owners these days bemoan the high cost which is associated with replacing an old ink cartridge with a new one. Especially for all those printer users who print in large volumes. However, there are quite a few cost-effective tips that will enable you to save on ink cartridges. The sole purpose of this article is to highlight a few handy tips that will increase the longevity of your ink cartridges and enable you to save your money. So, let’s get started and discuss about the tips which are mentioned below. Most of the printer buyers are opting for a printer that has a low cost per page. Yes, these printers would come at an extra cost when compared with the other printers but in the long run, these will prove to be cost-effective. The cost of an ink or toner is inversely proportional to the price of the printer. This means that a high-end laser printer has a pretty low cost per page while the cheaper printers would prove to be quite expensive in the long run. Replacing the exhausted ink cartridge with the same cartridge that has been manufactured by the ‘original equipment manufacturer’ will turn out to be an expensive affair for you. However, in order to save money, it is advised to buy cartridges from a non-OEM supplier or a third party. You will be amazed to find out that the cost of the third party cartridges is literally five times less when compared with the original ones. Often is the case that most of the times we print documents for our own causal use. This is where you can save a lot of your printer ink. All you need to do is go to your printer settings and click on the Preferences button. Over there you will be able to find a Draft or Fast option under the Print Quality option. Just enable the option and begin printing. Over time you will be able to find that the overall ink usage has reduced. Yes, this is true. Changing your default theme would make you save on your printer ink. However, you would be able to witness savings only when you are printing in bulk quantities. But still, it is better to avoid using those fonts which consume way too much ink when compared with the other font choices. A few of the fonts that use less ink is Garamond and Times New Roman. While the fonts like Verdana and Comic Sans should be avoided. Gone are the days when it was essential to have a physical copy of literally everything. Nowadays, you have a digital copy of all your important documents. Printing documents in the PDF format is a great way to retain the formatting and content in its original order. Print only those documents which you cannot do without having a physical copy. The best part about the digital versions of the documents is that you will be able to send them to the concerned person with a mere click. Most of the websites offer the printer friendly version of the content that is displayed on the website. By doing this, all the ink sucking ads and images will be removed and all that you would be left with is text. This is a great addition to the wide range of features which are integrated into the websites. There is no point in wasting the printer ink on a logo or a colorful ad when the same message can be delivered by its black and white version. Just change the default settings of your printer to grayscale. This will spare the color cartridges from getting used when they are not really required. Most of the people buy ink cartridges in bulk as they are offered heavy discounts on them. However, in doing so there is a possibility that these cartridges might get clogged and begin to malfunction. Therefore, it is advised that you do not buy cartridges in excess. No need to fall into the trap of the attractive deals and discounts as instead of saving money you would end up wasting it. 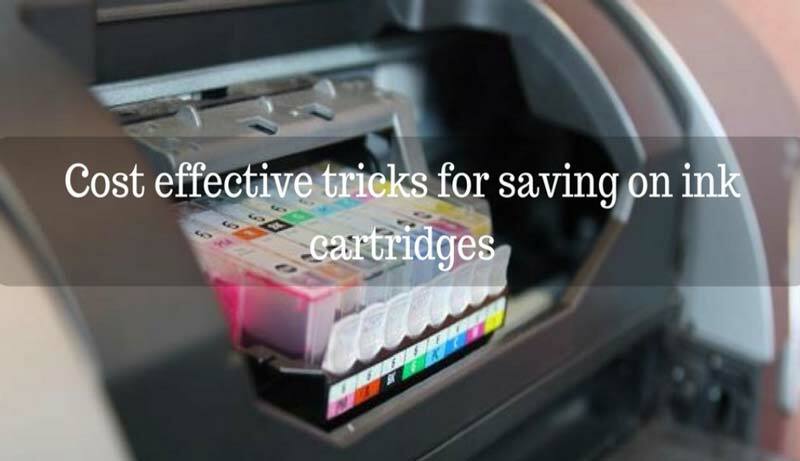 All the cost-effective tricks which have been showcased in this post will enable you to save on ink cartridges. Adhering to all these is not a tough task either. Immediately you would not be able to see the results, however, in the long run, you would definitely save your printer ink. I would love to know your views about the article in the comments section below. Also, do let me know if there are any other effective tips that will enable you to save on ink cartridges. David Blakey is a blogger by profession with 5 years of experience. He is associated with Hot Toner, selling hp officejet pro 8600 ink cartridges online in Australia. He is an admirer of sharing his innovative ideas with others on the technology trends.